LATTA, S.C. (AP) — A small town police chief in staunchly conservative South Carolina is trying to make history by becoming the first female sheriff in the state. And the first openly gay one, too. Crystal Moore knows the November election will be tough, but she has beaten the odds before. Just two years ago, residents in Latta (population 1,400) rallied around Moore after the mayor fired her. He was later caught on a recording ranting that he would rather have a drunk watch a child than a lesbian. When the tape surfaced, residents voted in a special election to strip the mayor of his power and the Town Council rehired Moore. A few months later, gay marriage was legalized, and Moore married her longtime partner. They now have a 7-month-old daughter. “That firing really turned out to be a blessing in a way. I saw so much support and then the story went national, and even more people got to see how special this place is,” Moore said. Now Moore is running for sheriff in Dillon County, a former tobacco hub of 31,000, probably best known for its South of the Border rest stop — a Mexican-themed collection of restaurants and gas stations — on Interstate 95 near the North Carolina state line. In 2006, nearly 87 percent of people in the county voted for a state amendment banning gay marriage. And even some of Moore’s supporters worry people not openly hostile toward gays might get a bit of homophobia at the voting booth. Moore is running as a petition candidate, unaffiliated with any party, against a Democratic incumbent seeking a third term. Not being associated with any party may hurt her because the 15 percent to 25 percent of county voters who hit the button to vote a straight Democrat ticket will automatically select Sheriff Major Hulon. Moore doesn’t say much about why she didn’t run in a party primary. But Hulon looked vulnerable in June’s Democratic primary, winning by 251 votes out of 7,073 cast. He won his first term by nearly 1,100 votes. Across South Carolina, voters weren’t happy with incumbent sheriffs — eight of the 45 lost in primaries. Moore believes it’s time for a change. The county’s unemployment rate remains a few percentage points above the state average and residents complain about the crime rate, although viable statistics are hard to find. “This is just my way of serving a place that has given me so much,” said Moore, who has spent nearly all her life in the county. Hulon didn’t respond to several messages from The Associated Press. His supporters also didn’t talk much, especially about whether they think Moore’s sexuality or gender will make a difference in November. “He has done a commendable job and I’m going to support him,” said Otho Lane of Dillon. Moore knows she will need to raise money for yard signs and maybe a few billboards. She has done it before. 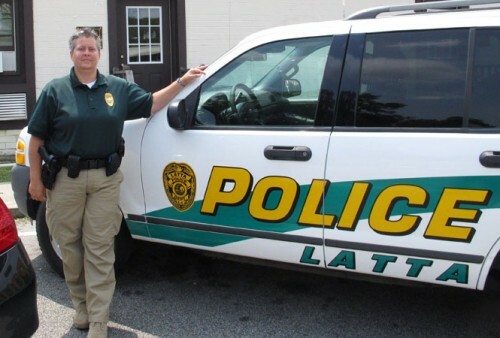 Donors paid a good chunk of the $20,000 in legal bills she racked up getting her job back as Latta’s police chief. On a recent Friday, Moore walked around sweating in the soupy late summer air with a stack of flyers and a clipboard of voter registration forms. She approached a home that had a Jesus sign and religious statues in the yard. Mary Odell invited her in. Moore shrugs off the quiet discrimination. She keeps doing her job, helping people like she did in 1989 when Hurricane Hugo tore up the county. She was a part-time police dispatcher at the time, still in high school, and she grabbed a chain saw and helped fellow officers open up roads. As Moore walked around a neighborhood, Shawn Harley stopped her and gave her a big hug.